These colorful, attractive point of purchase boxes make a great retail display while maximizing space. Each box of 50 is clearly labeled from the outside; 600 tubes per case. 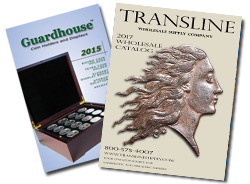 Guardhouse's new coin tubes feature a unique, proprietary design and are the perfect solution for storing American Silver Eagles. Sleek and ergonomic, the Guardhouse snap-tight lids and translucent tubes allow for easy identification of their contents, stack for tidy storage and also fit perfectly in the US Mint American Silver Eagle Monster Boxes. Convenient thumb slots allow for quick access when boxed. Lids on these American Silver Eagle tubes are green.